Chew Gum for Good Grades? Do you chew gum in class or while studying? If not, then maybe it is time that you start. In college students are always looking for ways to boost their grades. A lot of students go to office hours. Some students go to Lion Tutors. Others resort to study drugs. What if there was an easy way to give your grades that little extra boost that you need without spending a little time or money? Maybe the answer is brain-boosting gum, or maybe all you need is just some gum in general. Gum has been found to increase heart rate and blood flow as seen here. This means that more oxygen will be getting to our brain, but does this mean better grades? There have been experiments done that have actually produced results that agree with this hypothesis. In these experiments, the common theme is that gum helps people stay more attentive for longer tasks, have quicker reaction times, and have better memory. A Toronto teacher is such a big believer in gum that she encourages her kindergarten students to chew gum in class. She said that she has noticed the kids are more attentive, less anxious, and more likely to sit still while chewing gum. Many other teachers have agreed with this too, but they are unsure of how to introduce gum in a classroom because of the many problems it can cause. Gum can even be used while studying. That extra focus for longer tasks can be put to good use while studying too. Some researchers believe that chewing gum while studying and while taking a test makes it easier for your brain to remember the studied information. I’m not saying gum will get you an A in every class, but it might help you to get a couple more answers right on your exams. Gum is relatively cheap so you don’t have to worry about costs. There also have been many advancements in types of gum over the years, so you don’t have to worry as much about the health effects. With all this great news about gum, everybody wants some. This entry was posted in Uncategorized on September 8, 2016 by Thomas John Krieger. I think that your article is very interesting because I have heard some of my teacher’s say to chew gum while studying. I remember when I was taking the SAT’s and ACT’s my teacher’s would tell me to chew it because it would make the answers flow better. Now I understand what they meant from reading your article. I found an article that talks about the effects of chewing gum while studying and in class. One of my biggest take aways from the article is that it talks about how chewing gum can reduce stress and anxiety. I think you raise a very interesting point in your post. I consider myself a pretty anxious/antsy person, so during classes I often shake my leg, click my pen, or tap on my desk. I know these actions are distracting to my fellow classmates, but often these are impulses that I can’t control. For these reasons I often chew gum while studying. I don’t in class because I have a habit to snap my gum. I’ve also been very involved with theatre the past years as a stage manager, often running many large productions. In these high stress environments I tend to chew gum. Chewing gum helps me to focus on my tasks and helps me to relieve stress. I don’t exactly know why gum is a stress reliever, but it works for me. Even with all of this being said, gum is still banned in many schools (including my own middle and high schools). Thank you for sharing! I find your blog post to be very interesting because honestly I have to disagree with the overall idea and studies. Whenever I chew gum I notice myself thinking about the taste, blowing bubbles and messing around with it in my mouth. In addition to gum distracting me, when others chew gum it can be distracting as well. I think we all know that one person who chews gum like “valley girl” and its so annoying! https://www.youtube.com/watch?v=nv4yruWX7HI When I sit near these people in class it drives me crazy! As much as I love gum, I think it should stay out of the classroom just to save other students from being distracted. I wanted to research this topic myself for a future blog post because I, being someone who actually does this, was curious to see if this was true. All throughout high school, I believed that chewing gum during lectures and then again while taking the exam, would help me focus and spark some memory of what was taught in the lectures, hopefully increasing my chances of scoring better on a test. From personal experience, I do believe chewing gum makes me more focused, but I don’t think chewing gum is something people should rely on for helping them get their A. Don’t forget about the other important factors contributing to receiving high test performance, such as: studying, going to class, taking notes, staying organized, doing homework, asking questions, getting good sleep, etc. It is also important to note that not all people have the personality traits that will allow gum to focus them. So I hope no one gets the impression from after reading your blog that if they don’t dedicate an efficient amount of time to study for their exam, that as long as they take out a piece of gum to chew while taking the exam, all focus and memory of the topic will be regained, and solidify them an A. Coffee is another example, that if used, can make you smarter according to this link, https://authoritynutrition.com/why-is-coffee-good-for-you/ but like the gum, there are also pros and cons of using this substance, especially an excessive amount. I find your post very interesting. I never thought about it for academics, but for sports I always chew gum. Every time I’d go to the skate park I’d pick a pack up and kill it throughout the day. It made me feel less worried about if I was going to land the trick or not. I’d also chew gum while I played soccer or when I was warming up for wrestling. It took my mind off the actual competition and left me room to slow things down and think. This following study (http://scialert.net/fulltext/?doi=pjn.2009.1898.1901) conducted an experiment to see whether or not athletes perform better while chewing gum. Let me know what you think of the results, I found them very interesting. 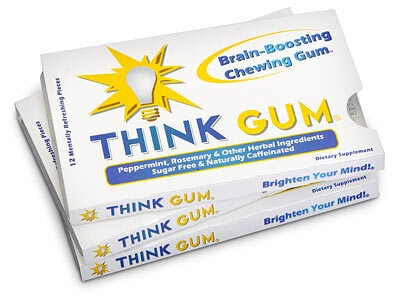 Although I have never heard of chewing gum for better grades, I have actually heard about how breath mints can help stimulate brain activity. When I was in elementary school, I remember having to take standardized tests every year. Year after year, before the tests, my teacher would walk around with mints because she said that they would help get your brain going. I never really put too much thought into this, but it is such a simple thing you can do, why not try it. I remember keeping a few mints in my pocket when I went into my SAT. Not entirely sure if they helped me at all, but I was able to hit my target score. Whether it was the mints or the hours of studying, I was able to achieve my goal. In an article found here, a mint’s ability to boost brain activity and help induce better problem solving are explained. Maybe my teacher wasn’t as far off as I initially thought when I was young. Are the health risks of chewing gum worth the grade, though? You might be damaging your health by trying to concentrate in class. So, does the benefit of chewing gum in order to boost your attentiveness while studying or in class outweigh the risk of damaging your health? You better decide before you jump on a bandwagon. My dad told me the same thing a couple months back! Gum will help you focus more in class and your tests scores are suppose to increase. I just have one problem with this, I hate the sound of people chewing gum. It is so annoying. I will be that person to tell you to chew with your mouth shut or spit it out. I’m even like that towards my family. I actually found this great buzzfeed article on why people hate it. https://www.buzzfeed.com/mirandalarbi/this-is-why-tiny-noises-make-you-want-to-kill?utm_term=.edGYNyvgV#.kk07zNZGk — I would give it a read! I always thought I was insane, but looks like I am not alone!